T.J. Keanu Tario, left, and Maile Cha, right, joined their teacher, Ellen Masaki, at the piano just before her 80th birthday celebration earlier this month at Kapiolani Community College. 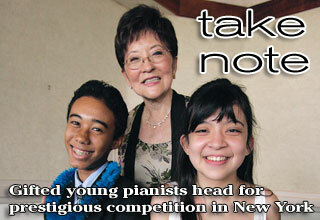 The students are among just 22 invited to the New York Piano Competition. Fishermen are caught between rising costs and lower fish prices. Business owners must demand clean energy to bring the state out of trouble, Kaya says .